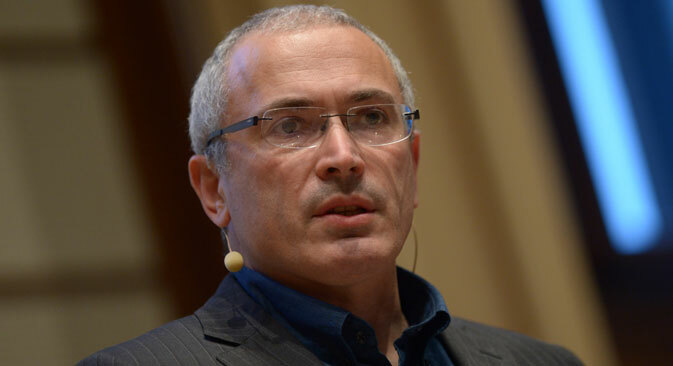 Russian law enforcement agencies have put former Yukos CEO Mikhail Khodorkovsky, who has been charged in absentia in a case opened into the murder of Neftyugansk Mayor Vladimir Petukhov, on the federal most wanted list, a source familiar with the situation told Interfax. "A federal search for the suspect has been organized," he said. Further steps to be taken by the Russian Investigative Committee could include declaring the suspect internationally wanted and requesting his arrest in absentia, the source said. For her part, Khodorkovsky's spokesperson Kulle Pispanen has said that the address of the former Yukos head is known to investigators. "It has been posted on the webpage of Open Russia as well," Pispanen said. No measures have been taken after the businessman's father, Boris Khodorkovsky, was summoned to the Russian Investigative Committee, she added. On Oct. 25, 2003, Khodorkovsky was arrested on charges of misappropriation and tax evasion. In 2005, he was found guilty of fraud and other crimes. Bearing in mind subsequent appeals, his prison term as set by the court totaled ten years and ten months. On Nov. 12, 2013, Khodorkovsky, without admitting his guilt, asked Russian President Vladimir Putin to pardon him citing family reasons. On Dec. 20, 2013, Putin signed a decree pardoning the former Yukos CEO. Russian Investigative Committee spokesman Vladimir Markin announced on June 30, 2015 that a criminal investigation into the murder of the Neftyugansk mayor had been resumed. Neftyugansk Mayor Petukhov was shot dead on his way to work on June 26, 1998. At that time, Yukos was the main employer in the city and the mayor allegedly had a conflict with the company over unpaid taxes to the local budget. The mayor demanded that a criminal investigation be launched against Yukos. Former head of the Yukos security department Alexei Pichugin was convicted of killing Petukhov.